Wald's Wanderings | Not all who wander are lost. Has it really been almost 2 months? So, I went AFK for about 2 months. I have been busy with work, school, and sort of trying to to ignore the GW2 hype. If I think about it less maybe time will pass quicker. I am still hyped, the wife is still hyped, and other then Pokemon cards there is nothing else my 8 year old son wants to talk more about with me. I also needed some time to get the guild organized and headed in the right place. Mostly it was figuring the server, I have never had to pick a server for a guild to start on. That is a pretty scary and daunting task. Through the betas I was able to figure out what classes and races that I will be playing. My main will be a male Human Necromancer. This is the character that I will play when I play with my wife. I did not play the Necro during the betas, because I want to save it for live. I played a Necro as my main in GW1, and I have no doubt I will like playing it in GW2. My second main will be a male Charr Engineer. This will the character that I play with my wife and son. I did play the Engineer to about level 5 in the betas. I have always loved turrets in all games. In GW1 I enjoyed the Ritualist a lot, and its spirits are essentially turrets. My third main will be a female Sylvari Mesmer. 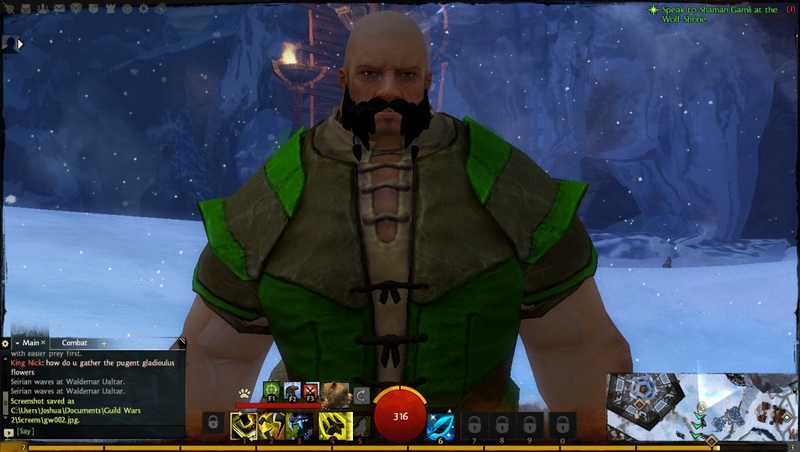 This is the character that I will play solo and in WvW. I did not expect to like either the Sylvari or the mesmer. However, in BWE 3 I fell in love with both. I came very close to making the Mesmer my overall main, but I think it will work better like this. My fourth character will be a male Human Guardian. I am making this one to reserve the name and to get him birthday presents if Anet includes those in this game. The Guardian is another class that I did not expect to like, but found to be much better and different then expected. While this may sound weird the Guardian also fits my character. This name was also used for my GW1 warrior and LOTRO captain. So he kind of needs heavy armor. My fifth character is going to be a male Asura ranger or warrior. I haven’t decided which class yet because I found both to be good. Anet made the classes so good that it is very hard for me to decide which ones that I like. In fact I haven’t found one that I dislike yet. I didn’t even expect to like the Asura, but their rolling, jumping, and running won me over. My guild (Khazad Fundinul) will be playing on the Tarnished Coast server. It is the unofficial RP server. While we are not RPers for the most part, we do appreciate the mature community that often goes with RPing. Since we are mostly over 30 years of age, we like to have that mature adult type of community that respects other people. This is not meant as in in depth theory crafting breakdown of the ranger. It is just my observations after playing over the last BWE. I am looking for a third class to play, and the ranger looked interesting. I tend to play ranged more then I do melee, but the ranger offers the opportunity to play both. I most used ranged weapons because I have a bad internet connection right now, and ranged seemed to be better when I had little lag spikes. Other then the sword, I found all the weapon types to be pretty good. Toward the end of the BWE, and in WvW I ended up mostly using the axe/torch and a longbow. The axe/torch works well together. Lay down bonfire, and then stand just behind it to throw axes through it. Having that extra burning damage added to the axe damage itself is fun, and seeing the enemies on fire is satisfying. The longbow is kind of the traditional ranger type weapon. I found it good for walking around in PvE, because I could stand far away while my pet distracted the enemy. In WvW, the longbow was good for keeping me safe and alive while other people died. I did not like the 1h sword to much. I made my ranger the most massive Norn that I could. Seeing him flip around like a karate movie star just looked silly. Maybe if I made a smaller character it would have worked better, but as it is I don’t know if I could use the sword for him. After reading about pets in various places, I kind of expected them to be worthless. I started with a brown bear, and charmed an Ice Drake, Wolf, and Blue Jellyfish. I only played with the bear and drake. I found them to be pretty good. They did exactly what I expected, and that was get between me and what I was fighting. Maybe I have low expectations of a pet in games, but if I get hit less and they can absorb hits for me then I am going to be happy. I tried all the healing skills. None of the 3 skills really felt like it would get you out of serious trouble. By that I mean they are not large heals that will make up for bad play. I liked Healing Spring the most, but if something is smashing you in the face then Healing Spring isn’t so good because you have to be in the circle it creates for the heal. I found I liked using fire trap with healing spring for when things came after me. I didn’t get to try many of the utility skills. Basically, I only used the Owl spirit and the flame trap enough to talk about them. The bleed from the owl didn’t seem to make much difference most of the time. I think it might be better in fights against creatures with larger health pools where conditions will have more time to work. Flame trap was great for damage if something came after me, and for setting up combo fields in certain fight types. I had flame trap on when I went into WvW, and I end up using it when we assaulted a keep. I put it near the door where the other team could come out, and it seemed effective there. Overall I found the Ranger class to be a lot of fun. It is versatile enough to not get boring. Sick of pew pewing with a longbow? All you have to do is grab a sword and all of a sudden you are playing a totally different class. The class is durable enough to take some good hits, yet is mobile. I think there is a strong chance I will play the Ranger when the game goes live, all I need to do is give the mesmer a good try if there is another BWE. My first online game was Guild Wars, and since it was instanced you never saw people outside of your party in the world. I moved from GW to Lord of the Rings: Online as my first real MMO. When I was new to LOTRO I could often try to help people that I saw while I was running around. I was a captain so I could heal them or help attack what they were fighting. Pretty quickly, and to my surprise, I learned that was considered a no no. People thought I was trying to steal their XP, or kill the things they needed for their quest. So instead of helping people, I would usually just run right past them. Sometime I might look and see if they were in big trouble, and if they were I would help then. 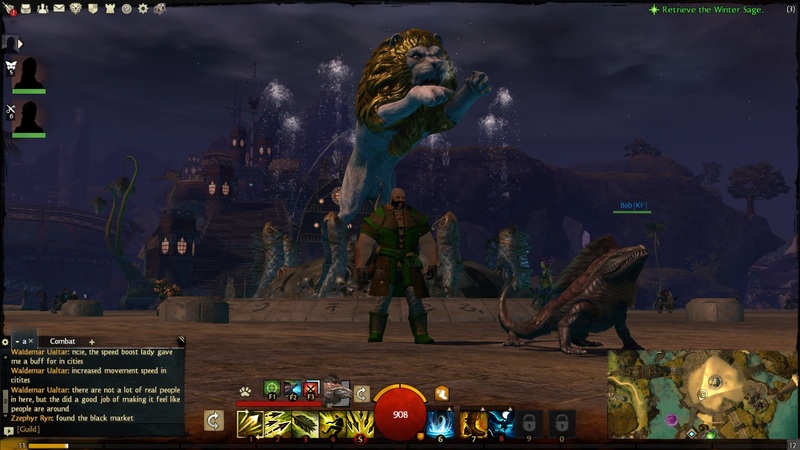 Along comes Guild Wars 2 were Anet has promised that it will be possible to help people without hurting them. By that I mean they will still get the kills and XP that they need. Reading about it, and promises are one thing. It is something else to be able to see it yourself. This is sort of a simple example, but it was the moment when I truly realized that everybody can be friends and work together in GW2. There is no PvE competition for kills, XP, or loot drops. I was in the Norn level 1-15 area just sort of running around exploring. I found a cave with a bunch of Ice Elementals in it. I didn’t have any real reason to go in there other then exploration. There was another person just starting to go into the cave when I got there. Without any discussion or grouping, we both just started to kill the elementals. I was playing a Ranger with Healing Spring, and the Axe/Torch combo. I would occasionally lay down Healing Spring or Bonfire. I cannot remember what class the other person was playing, but we were doing combos off of each others skills and generally helping each other. We cleared out a bunch of Elementals as we moved through the cave. Eventually, we left the cave without talking to each other. In LOTRO, as in many other MMOs, we would have been in some sort of competition. Who could “tag” the mob first? Who could kill fastest to move on to the next kill? In GW2 we helped each other. I have to say that Anet fulfilled their promises in this instance very well. It does pay to help other people. Everybody gets the quests done, gets loot, and gets XP. If anything you are punished in this game for not working together, and that makes me very happy. Not much to say, other then about 10 hours until BWE2 opens up. The suspense is killing me, and League of Legends just isn’t cutting it right now. Anet has released some BWE changes in the form of a blog. There are 13 different changes or additions that they tell us about in their blog. A few of them jumped out to me. We listened to a lot of the input we received from players regarding their experience with overflow servers in the first Beta Weekend Event, and we’ve implemented a new party UI that tells you when party members are on a different overflow world. We’ve also given party members the ability to fast travel to overflow worlds where other members of their party are located, and we’ve made it easier to keep party members together when moving between maps. It’s all designed to give you as smooth an experience as possible. This one is huge for me since I will generally be playing with my wife, son, and guild mates. I like the opportunity to be able to map to the same location as those that I am grouping with. This will add a lot to the feel of community. On a less dangerous note, the Mystic Forge has arrived in Lion’s Arch. This strange forge actually holds the imprisoned djinn Zommoros, who hails from distant Elona. If you offer the Mystic Forge gifts (like unneeded items and weapons), you will receive a gift in return. Got a pair of pistols that you don’t need? Drop them in the Mystic Forge and see what Zommoros gives you in exchange! Ok, I am curious about this. Can I keep trading items until I get something like? If I trade pistols and get a sword can I trade that sword for something else? This seems like a really fun way mess with junk loot. Also is there the opportunity to get something really great or will this all be basic items? I will have to see how this thing works. Once again, the Mists will echo with the sound of combat as we open up World vs. World for the weekend. As usual, massive armies of players from different servers will battle for supremacy on four huge maps, but this time we’ve added a couple of interesting new twists. Players can now take their WvW battle underground in a new “mini dungeon” beneath the central map. This brand-new subterranean level is full of tricks and traps that can be used against enemy players, and is home to the aptly named Dark Room, which players will have to see (or not) to believe. I am not usually into PvP, but WvW looks like so much fun. I am going to have to go into WvW to see how good it is. Anet is cramming a lot into the WvW arena. I think this could be the defining section of GW2. What class to play during the 2nd BWE? I am facing a dilemma. I refuse to play the Necromancer and Engineer during the beta weekends since those are going to be my main classes once the game goes live. I will be playing the Necro as my main when I play with my wife. I will be playing the Engineer when my wife and I play with our oldest son. However, if the game comes out in the next few months I will have quite a bit of time to play solo, and for that I need a third character. I am thinking of reusing a name I first used in GW1 for my warrior, and then used as a captain in LOTRO. In GW he was my 2nd character, and LOTRO my main. He has always been a melee, heavy armor wearer. So it seems weird putting him in anything other then heavy armor. Yes I know that is odd and sort of geeky. I am writing a blog about MMOs after all. I want to use the BWEs to help find bugs, and also to find what class I am going to use for my 3rd character. In the first BWE, I had very limited internet access. I did play the Guardian a little. I came to the Guardian thinking I wouldn’t like it based on my dislike of the LOTRO Guardian. I found the GW2 Guardian wasn’t bad to play. It does more damage then I expected and did some nice buffs and such. I just am not sure if I want to play a class like this. There is something that just doesn’t work for me, but I can’t put my finger on it. I might try the warrior. The combination of ranged weapons in the Rifle and Bow with the melee weapons is very appealing. It does fit my characters history of being a warrior and captain. I just wonder if I am gravitation to this class to fit that history. The Ranger also interests me. It seems like the ranger is pretty durable and if built correctly can go toe to toe in melee range. I like the idea of having a pet, but pets in MMOs usually seem to be pretty dumb with many pathing issues. I also like the Mesmer and the illusions. However, I had bad memories of the “armor” that mesmers had in GW1. I don’t want to go around fighting monsters while dressed like I should be in a play. I have no interest in the Elementalist or the Thief. So I have 4 classes to choose from, and I have only a little time to try them out. From what I have read in blogs and from postings in my guilds forums it seems like every class is fun. Almost everybody seems like they play a class only for the BWE, but they find it is so good that they end up with more questions as to what they will play when the game goes live. That is a testament to the work that Anet has put into GW2. However, it has me confused and wondering what to play for the BWE. Anet has announced that the next BWE will start at noon PST on the 8th of June. Existing Beta characters have not been deleted, so those that have played deep into the game will have the opportunity to try out the Ascalonian Catacombs dungeon. What I liked most in their announcement was this paragraph. We have listened intently to all of your feedback from our first Beta Weekend Event, and we’ve made great strides toward resolving many of the issues you’ve helped us identify. These include party movement into overflow servers, chat functionality, key bindings, server stability, performance, and many more that we will detail in the near future. Considering I plan to play almost exclusively with my wife and son the party movement is a big deal. I don’t mind the idea of overflow servers so long as my whole group gets put in the same overflow. I will also be interested to see what they have added for chat functionality. There where only a few chat channels available during the first BWE, and it left a lot to be desired. Right now I am very excited and am counting down the days already. A few days ago I redownloaded LOTRO thinking I might give it another go. I subscribed for about 3 years, but stopped soon after free to play started. I did try the free to play for a short time, but something about the game just didn’t appeal to me anymore. I logged into the game, and saw I was outside of my house. I tried to go in, but quickly realized I was locked out. Thinking nothing of it, I figured I would just pay the maintenance and then go in. I totally had forgotten that after you are away for awhile, there is a very steep price to unlock a house. My fees are about 6 gold 900 silver. The house originally cost me 7 gold 700 silver. All my legendaries have changed so I need to reallocate the points on my weapons. I have done that so many times, and really don’t feel like doing it again. I wish there were decent non legendary weapons for higher level characters so I don’t have to deal with that again. Lastly, my inventory is full so I figured I would sell some stuff to help pay for my house. Again, I had forgotten that non subscribers only get 5 slots in the auction house and you have to pay real money to get more slots in a fake auction house. Turbine is not making it easy for me to want to go back to their game. It is hard enough to have to relearn everything, but there are a lot of hindrances keeping me from jumping back in. I guess I am sort of remembering some of the things that made me leave, and maybe it is just an example of the old saying that you can’t go back home again. Hello, my name is Waldemar and I am a gamer. Well, Waldemar is sort of my gamer name, but it is usually shortened to Wald. My earliest memory of video games is Ice Flow for the Atari. I might have been around 3 years old then. When I was about 7 my parents bought a NES and I was hooked. Later I moved into computer games, and that is mostly what I play to this day. I used to play only strategy games, but a little over 10 years ago I got married. I know most of you are thinking, “There went his gaming time.” However, my wife is also a gamer, so through her my game interests changed. She likes RPG, and I tried them to make her happy. I found they were a lot better then I expected. The only problem is most RPGs are single player, so we were able to be together but not able to play at the same time. Then we saw an ad for Guild Wars in Game Informer. This was an RPG that we could play together, and we did for about 3 years. After that we moved to Lord of the Rings: Online for about 4 years. Now we are both eagerly awaiting Guild Wars 2. The great thing this time, is that our son who was born weeks after GW’s release will be getting an account too. My wife and I have 4 sons, so there isn’t always a lot of time for gaming these days, but we try to make the most of what we get. I will mostly write about GW2 from my perspective. As the name of the blog might imply, I like to wander a lot while I play. I don’t focus on just getting things done. I like to explore and see different things. I will end up blogging a lot about things I see in game. Especially things that go well with a screenshot. I am the guild leader of Kinda Fearsome the GW2 branch of the guild I have been in for almost 5 years. I might blog about my guild’s events, and how GW2 supports guilds. I also will throw in some stuff about various hobbies that I have. I try to teach my sons different things than video games. We hike, camp, and I plan to take up model rockets soon. If I need something to say here I might go with that stuff. Mostly I just want to have fun and hope that I can fit a niche in the gamer blog world that people will enjoy.